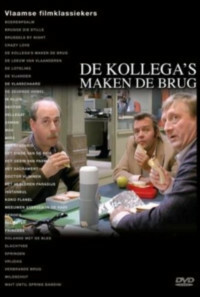 The movie made after the hit series "De Kollega's" starring the same characters, but rather tragicomic. When November 11, an official holiday (Armistice), falls on a Tuesday, the public service often gets an extra day off on the preceding Monday, but only after a formal ministerial decision, and this time it gets all the way trough the hierarchy to the right office- and then isn't read, so all the colleagues turn up, only to be told they should have stayed at home. It gets worse: works in progress and clumsiness end up blocking the way out both by lift and staircase, so they are stuck on their floor, apparently without a phone, while there's nobody outside who can hear and rescue them. Forced to keep their conversation going, some secrets get unearthed, and it's not a very pretty picture they got of each-other. Regions are unavailable for this movie. Click the "Watch on Netflix" button to find out if De Kollega's maken de brug! is playing in your country.